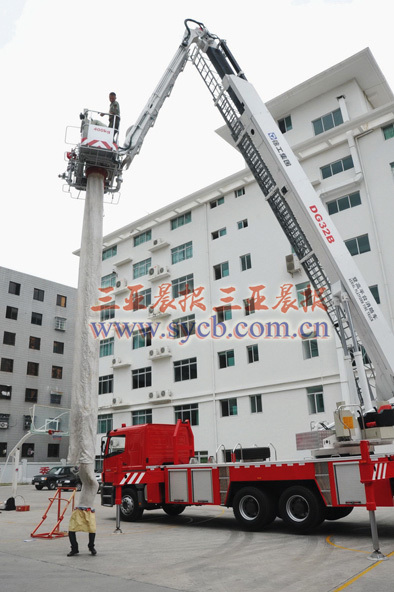 On 22th, December, a new portable fire escape chute was used on high-rise buildings and will serve the Sanya Fire Department. This equipment allows 30 people per minute to get through to escape from fires or dangerous places. This escape chute has been tested by the Warsaw JOSEF Fire Prevention Centre and can be easily attached to the aerial ladder of a fire truck as well as to windows and balconies as an emergency exit. The chute can be adjusted to the required height that is based on the building height. Once the fire occurs in high-rise buildings, the trapped people can get access to the escape chute within a short time. At present, there are a total number of 277 buildings above 24 meters in Sanya. The purchase and application of fire escape equipment in Sanya will greatly improve the fire fighting capabilities.